The Louis Vuitton Travel Book series are books that feature artworks of various artists in different locations. As of 2014, there are six books covering places such as London, Paris, New York, Easter Island, Vietnam and in this volume it's Venice. The artist for this volume is Jiro Taniguchi, a Japanese manga artist and writer. This is a 132-page hardcover about A4 size. The page edges are trimmed to a light orange, corners are rounded, and the cover comes with a rubber band to hold the covers together. Paper is matte. It reminds me of those landscape A4 Moleskine watercolour sketchbooks. Inside, we get a story, a narrative told by a young man retracing the footsteps of his grandparents in Venice. The story is presented in the style of comic panels. We follow him along the journey as he compares the old family photos he found to the places he sees. Each panel captures the sights and scenes of Venice. The artworks are beautiful and detailed. There is a lot to see. One can only imagine the amount of effort and time required to create all those drawings, and visit all the places shown. 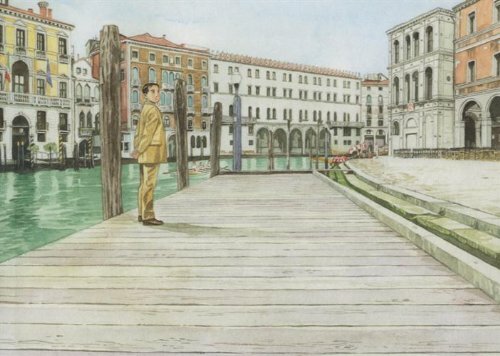 Jiro Taniguchi uses pencils and watercolours. I'm not sure if the outlines are drawn in but the familiar manga style outlines are there, but faint. The art and the presentation style adds to the comic book vibe. Composition is wonderful and convey the mood of a wandering tourist. Text in this book is written in Japanese, English and French. This series of travel books from Louis Vuitton is not cheap. It's not surprising considering the quality and amount of work featured. In addition to the standard edition, there's also a limited edition of 50 boxed, leather-bound copies are available at selected Louis Vuitton stores. Those would be crazy expensive.